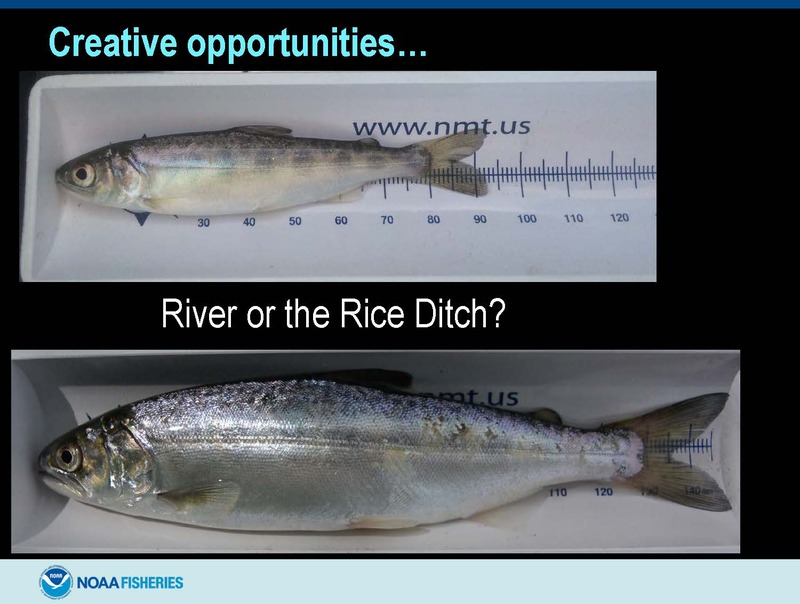 At the April 19th meeting of the State Water Resources Control Board, Board members heard an informational update from Dr. Sean Hayes with NOAA’s Southwest Fisheries Science Center on the results of the latest studies of predation on salmonids in the Delta, and specifically the San Joaquin River. 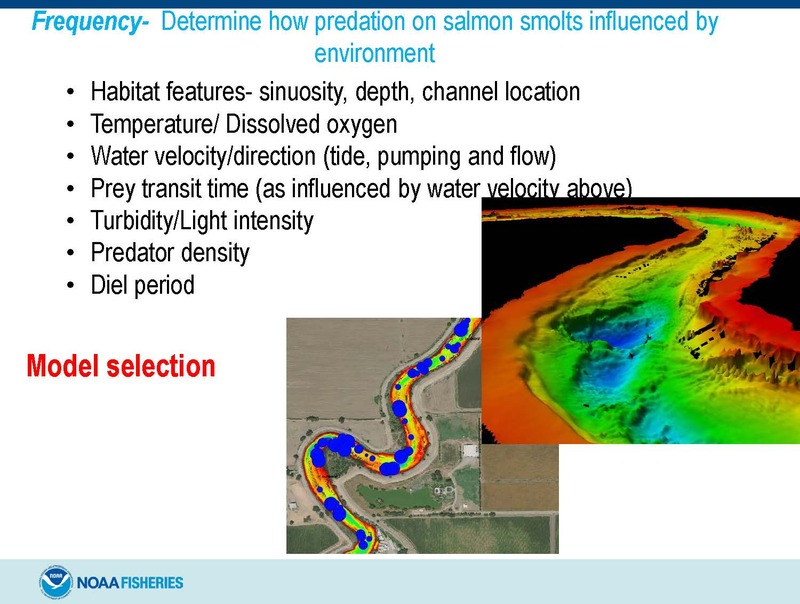 Dr. Sean Hayes began by saying he would be discussing the work being done in the San Joaquin, greater Delta and Central Valley watershed that is focusing on salmon survival issues and their challenges in the Central Valley. 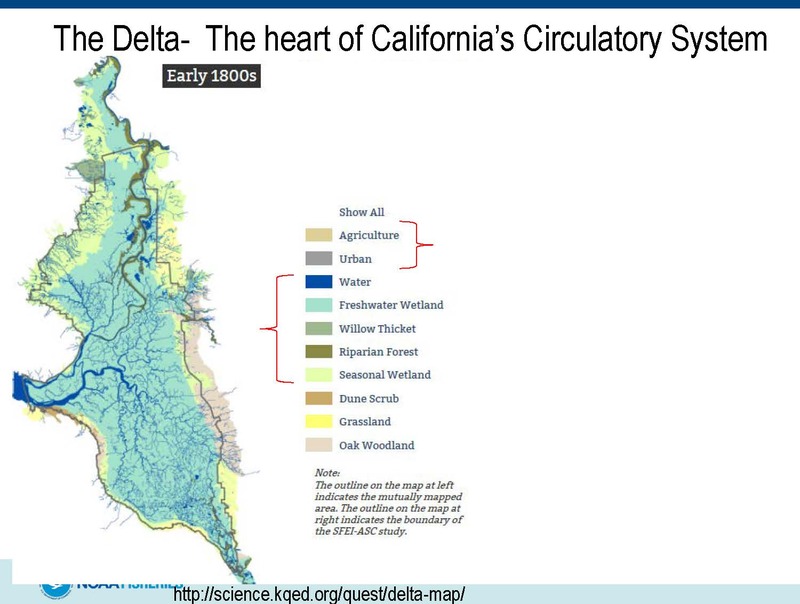 The heart of California’s circulatory system, in terms of both fish and water, is the Delta. 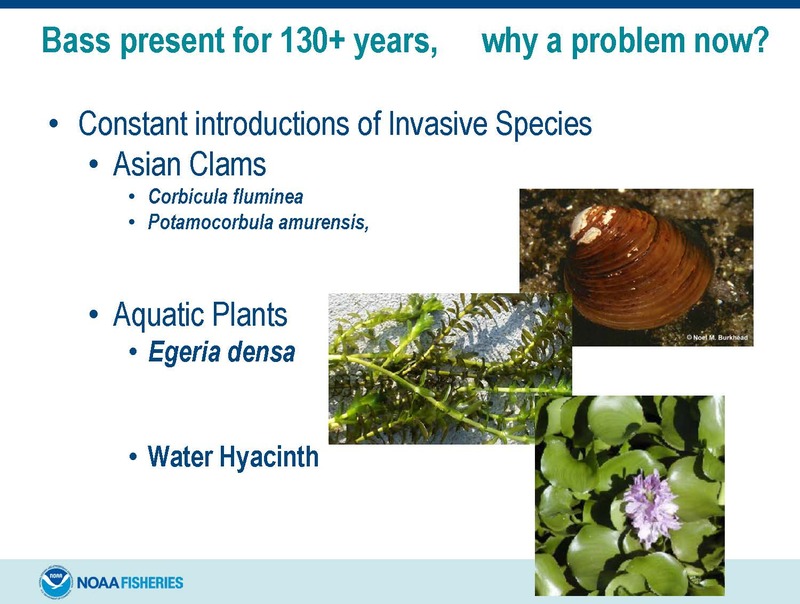 Prior to the reclamation efforts in the 1800s, the Delta was basically a large wetland habitat for fish and wildlife. 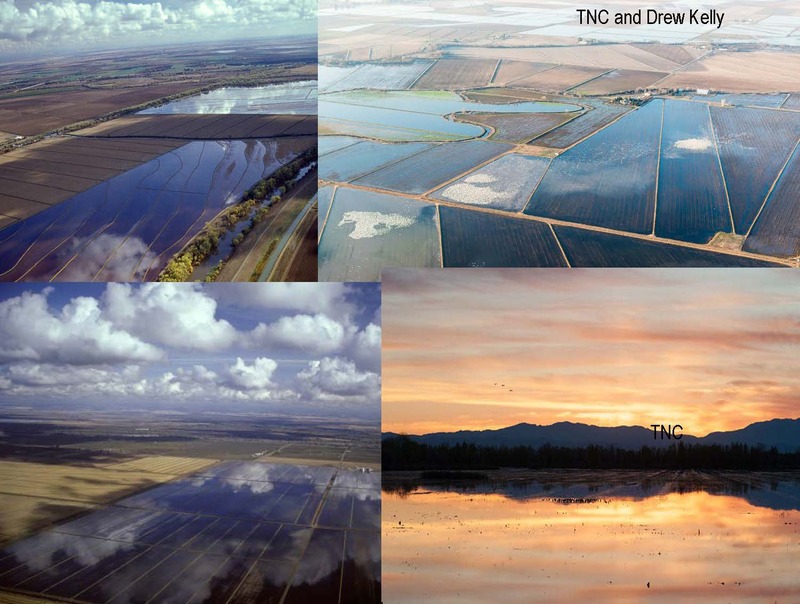 The Delta’s wetlands were then reclaimed in the late 1800s and early 1900s for the purposes of agriculture and urbanization. 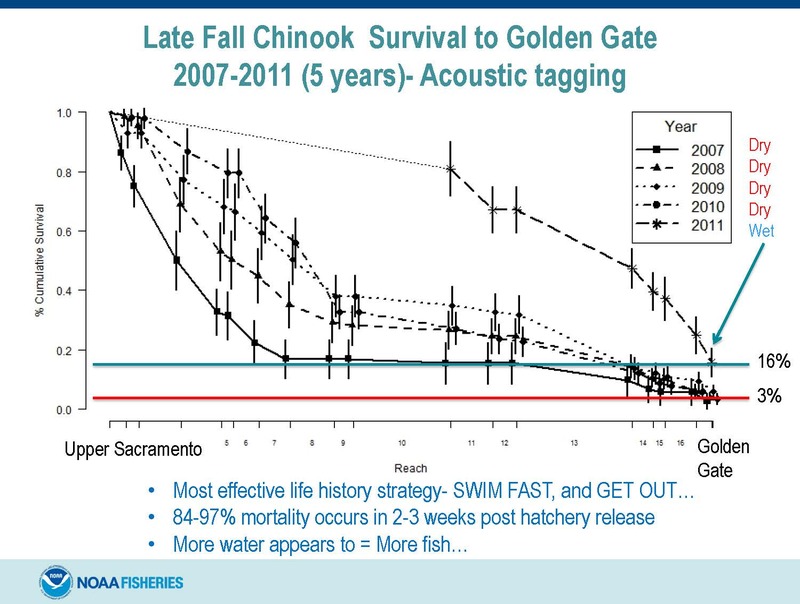 He presented a graph of results from an acoustic telemetry study conducted from 2007 to 2011 on chinook salmon that involved putting acoustic tags in fish were released from the hatchery in Battle Creek near Redding. 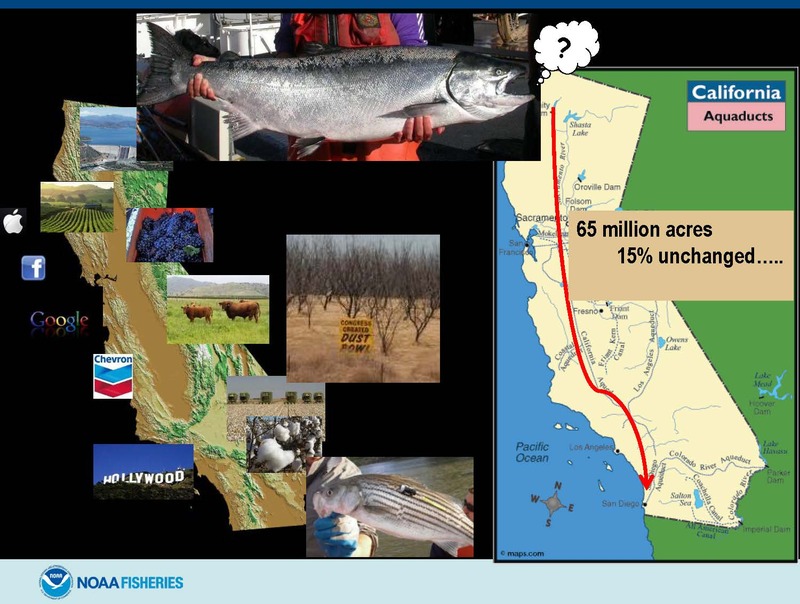 He explained that the left axis shows survival with the top of the axis being 100% survival, and the y axis shows the percentage of fish that survive as they are moving through the Delta to the Golden Gate and ultimately the ocean. 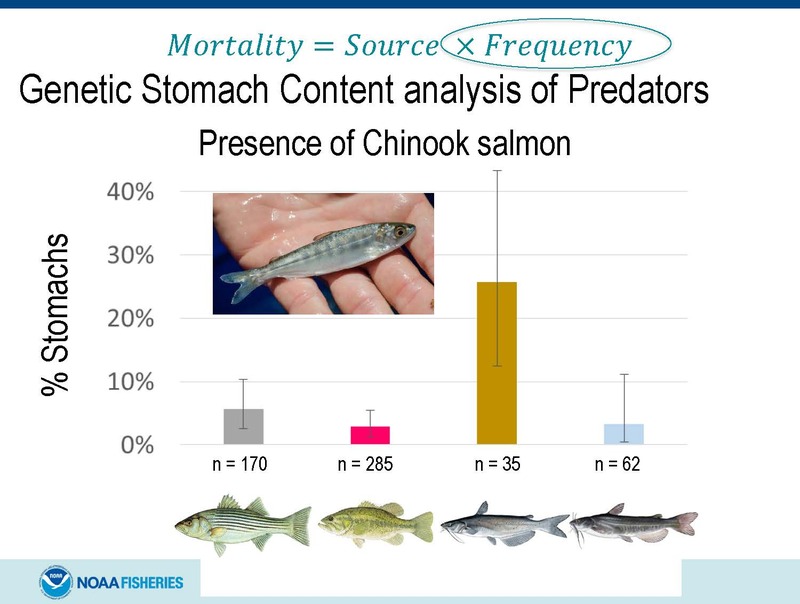 Dr. Hayes noted that this study subsequently has been done with all other hatchery stocks in the Sacramento River as well as wild stocks of fall and spring-run Chinook in the Sacramento. 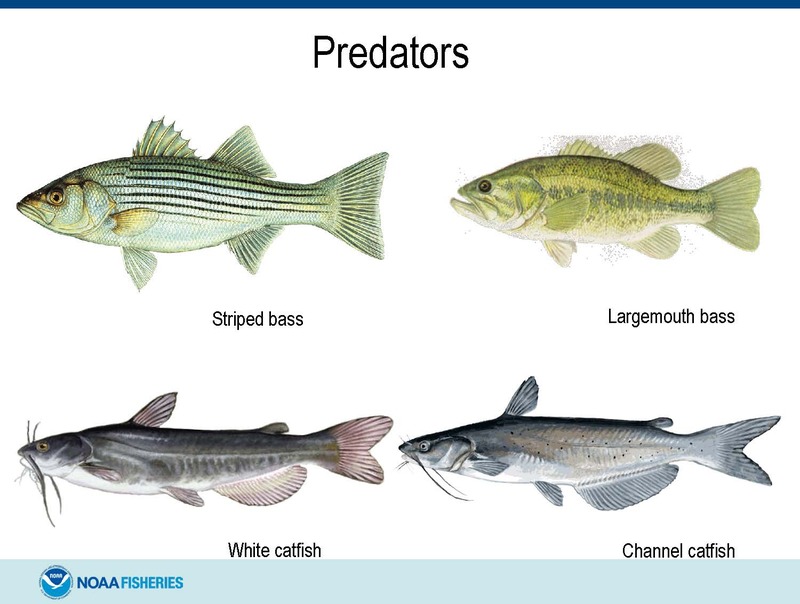 Dr. Hayes said he was tasked to study the effects of predation. 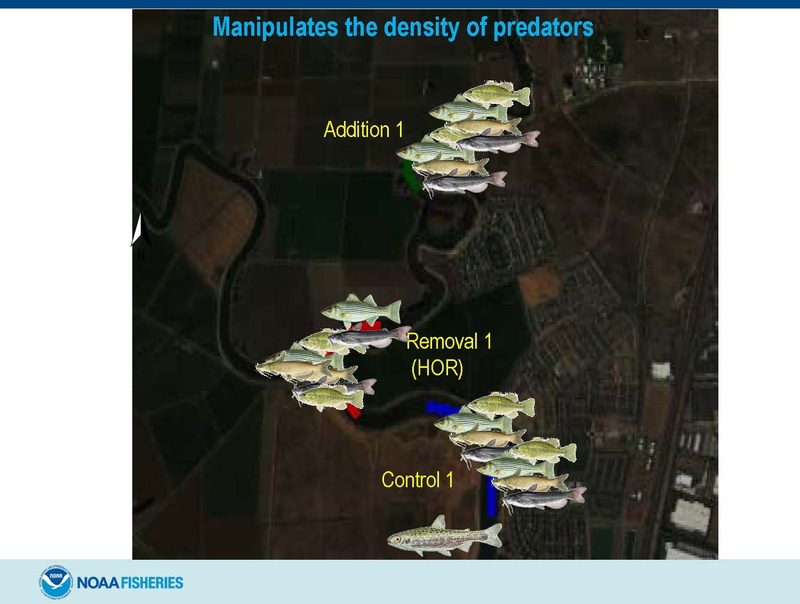 “When I first got involved with studying predation by bass and other predators in the Central Valley, I was asked the question, if bass have been present in the Central Valley for 130 years, why are they a central problem now?,” he said. 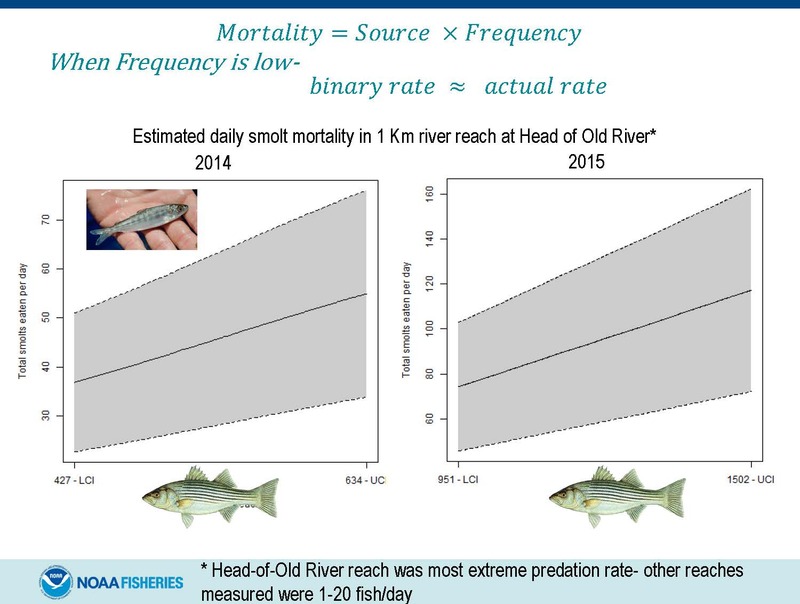 Dr. Hayes noted that he is showing the results for the Head of Old River because it is the focus; similar studies down in other reaches with more subtle habitat features had much lower numbers – 1 to 20 fish per day being consumed. “This is the upper estimate of what predation potential is,” he said. 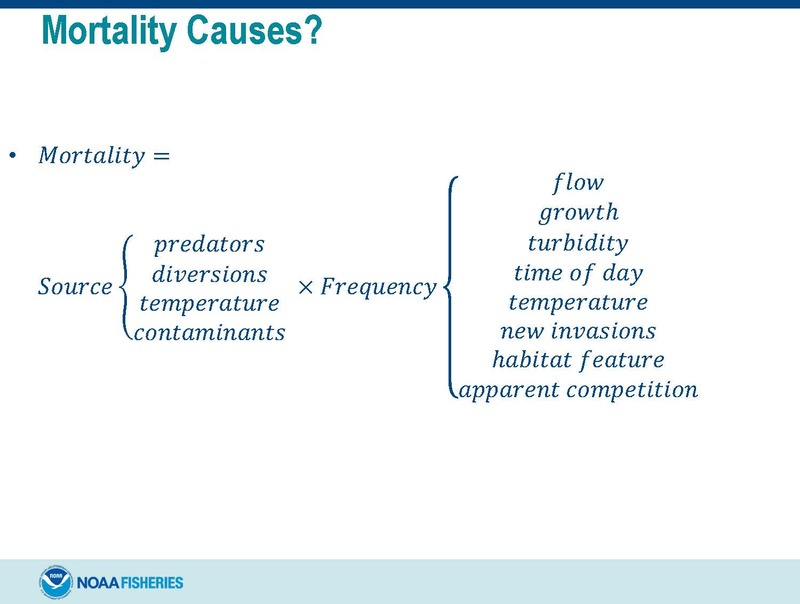 While that study gave raw estimates of mortality and consumption, the real question in terms of management is how do all these other variables come into play, and how do they interact with each other, he said. 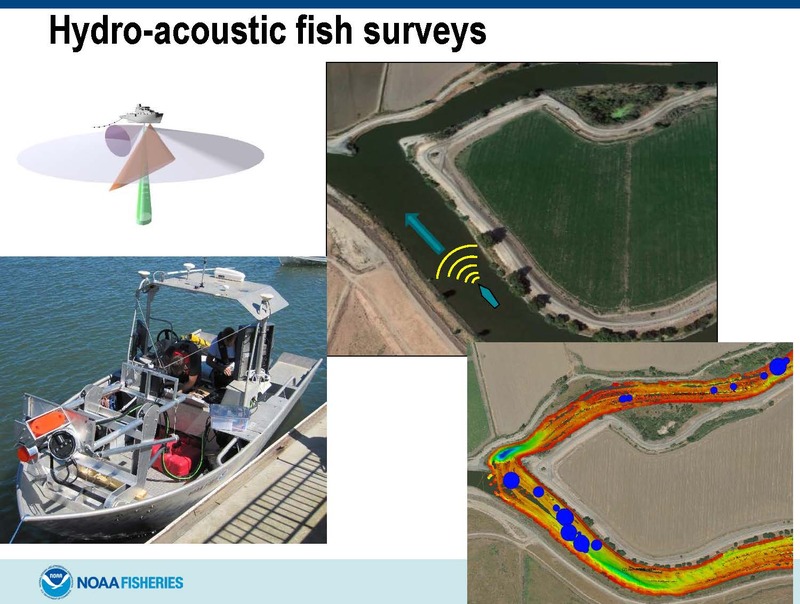 To test this, they adapted NMFS’s marine hydroacoustic surveys to conduct an acoustic sonar survey that would simultaneously map the bathymetry of the habitat, as well as count all the individual fish targets in the habitat. 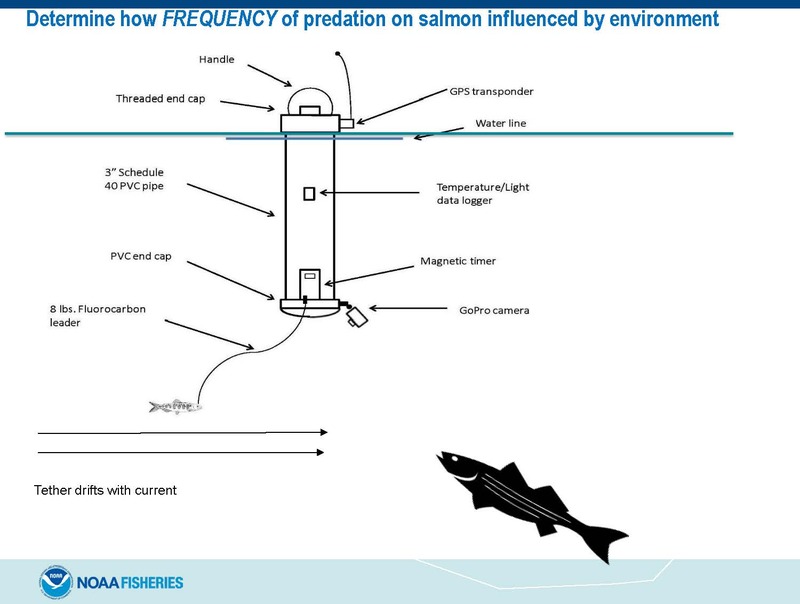 They then used multiple methods to identify the size targets of the fish to determine the predators and the juvenile fish. 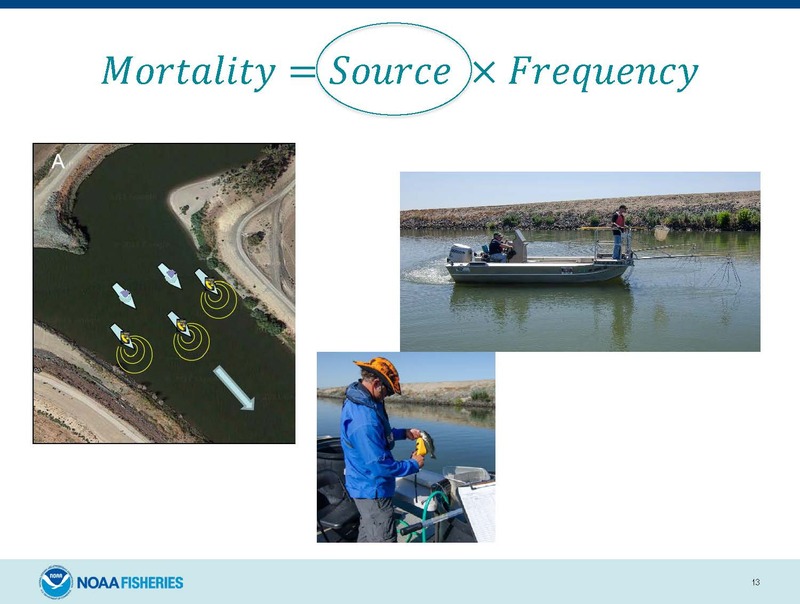 Dr. Hayes presented a slide with two pictures; the picture on the left is from a series of deployments of 20 tethers along a reach in the San Joaquin. The tether drifts from south to north or from the bottom to the top of the picture; each colored line denotes the individual path that a specific tether buoy took drifting through it, and the red dots denote where in the habitat a predation event occurred. “What you notice is that the majority of the predation events happen in a very small portion of the habitat, showing you that predation is not random,” he said. 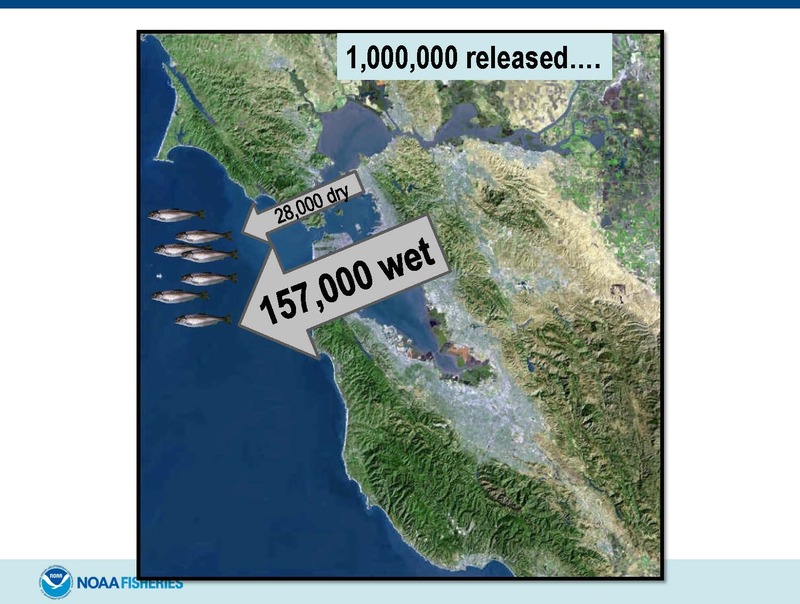 As for the timeline for the model, the first model which is calibrated just for the Lower San Joaquin will be ready for release to the public at the end of the year. 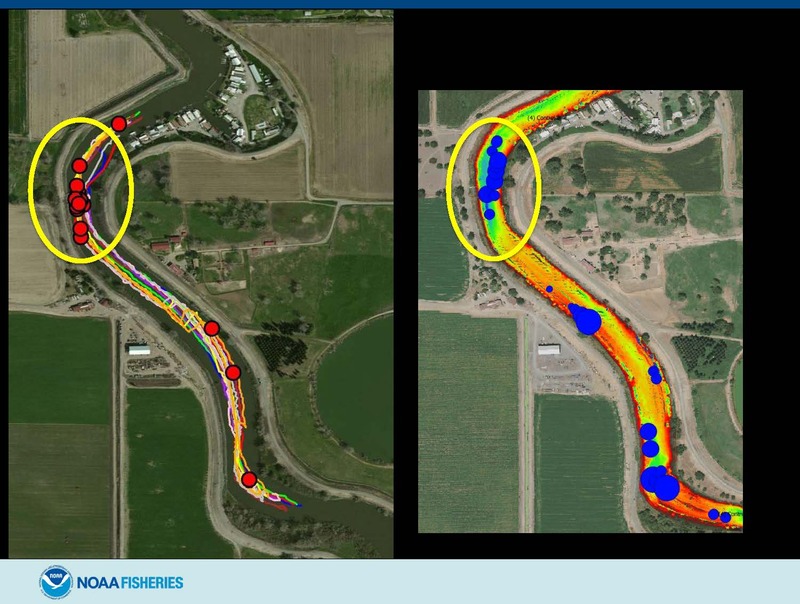 They have funding to calibrate the model to the greater Delta based on field studies in 2017, and they are hoping to find funding to calibrate the model to the Sacramento Basin with field efforts in 2017 and 2018.